Smooth, very musical, contermporary, classical, Christian piano music. It's Christmas is a collection of the more contemporary Christmas Music. It is unique in that most of this music has not been included on a Christmas CD of piano arrangements. In listening, you will discover a variety of music arrangements. 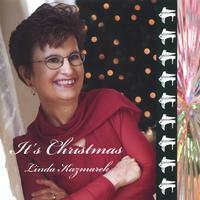 The title track "It's Christmas" is Linda's very own composition. The listener can clearly hear through out the composition the words It's Christmas stated very clearly with the music and rhythm of the composition. Take the music home with you, wrap yourself in the warmth of the musical sounds of the CD. You are sure to find many favorites whether you already know the songs or are listening to them for the first time. "It's Christmas" is 16 tracks of beautiful inspiring, uplifting piano music. A Christmas CD that should be added to any Christmas music collection whether large or small. As you prepare for the Christmas Season, remember the real reason for Christmas. Christmas is a time to Celebrate with one another, rejoice with one another, delight in one another, give gifts to those you love, greet one another with joy, and most important to remember that God's gift is still the greatest ever given. I really like the CD. So much in fact I almost wore it out the first day I had it. Great background music for entertaining. I love having background music going when I have people over, and this CD is a real keeper.